Immerse yourself in the elegance and style of the South. Your interlude with Dixieland begins in its capital, Atlanta. This evening, meet your Travel Director and fellow travellers for a Welcome Reception. Enjoy a day at leisure to explore the beautiful natural landscapes of the Smoky Mountains, so named for the "smoky" mist of blue haze that surrounds these peaks. Consider a visit to Dollywood, owned by country music legend Dolly Parton and embark on an evening of invigorating fun, stampeding at Dolly Parton's famous Dinner Attraction. Follow in the footsteps of brave pioneers who travelled through the Cumberland Gap into the West and into Kentucky’s wilderness. Delve into the equestrian heritage of this Bluegrass city in Lexington, at the “Horse Capital of the World.” Visit the Kentucky Horse Park or explore the International Museum of the Horse, an affiliate of the Smithsonian Institution. Visit the home of the celebrated Kentucky Derby, hosted at Churchill Downs race-trek since 1875. Fell the thrill of the "Greatest Two Minutes in Sports" as you explore the Kentucky Derby Museum, then enjoy an afternoon at leisure. This evening, we tuck into a traditional Kentucky Regional Meal, followed by some foot-stomping festive fun. Satisfy the petrol-head in you with a visit to Bowling Green's National Corvette Museum where you can admire the sleek lines and engineering feats of this all-American sports car. Leave your need for speed behind and continue south into Tennessee, arriving in Nashville this afternoon to meet your new travel companions. Tune into the intoxicating sights and sounds of Music City this morning. Find your rhythm as your Dive into Culture at RCA's Studio B and gain insights into the life and music of Johnny Cash during a private performance of Cash tunes with Johnny and June's granddaughter (or another family member). We'll visit the Country Music Hall of Fame and Museum and explore the collection of memorabilia from stars such as Hank Williams and Garth Brooks. Later, embark on a your choice sightseeing experience, exploring the Johnny Cash Museum or enjoy a tour of the Ryman Auditorium. Write your own song of the South on a full day at leisure before heading to the Grand Ole Opry, the home of American music since 1925. Take an optional walk in the footsteps of country music's superstars and get an exclusive look at what happens behind the scenes of the show that made country music famous. From country to blues, we head for the birthplace of Rock 'n' Roll on Beale Street, where we'll meet a musician and Local Specialist to learn about the musical heritage of Memphis. Our final stop today is the former Lorraine Motel, where civil rights activist Martin Luther King, Jr. was gunned down. Perhaps visit the National Civil Rights Museum, home to the former Lorraine Motel, where civil rights activist Martin Luther King, Jr. was assassinated. This evening is free. Our first stop is Sun Studios, which sought to capture the raw energy of Beale Street in the very first Rock 'n' Roll single recorded in 1951. Visit Graceland and worship at the altar of the King of Rock 'n Roll, paying tribute to a man who changed the face of American popular music and culture. Tonight, embark on a your choice dining experience choosing from a selection of local eateries. Kick off this morning's musical interlude at the Memphis Rock 'n' Soul Museum before heading to Natchez. Connect with Locals at a 1850s private residence of Joe Stone, who performs on his 1903 Steinway grand piano. We head to the 1804 residence of Esther Carpenter, a former Four Seasons chef, with whom we'll enjoy a traditional four-course Deep South dinner. Dive into Culture at Frogmore Plantation and Gins to discover the Mississippi Delta's cotton plantation heritage. We continue through the Louisiana countryside to Oak Alley Plantation where the spicy scents of Creole cuisine will linger long after our visit to the New Orleans School of Cooking comes to an end. Enjoy a fun cooking demonstration before indulging in a Regional Meal of Creole cuisine. Trace the cosmopolitan history of one of America's oldest cities with a Local Specialist, stopping at City Park and one of the famous above-ground cemeteries. Spend the afternoon at leisure exploring New Orleans. This evening, consider an optional jazz cruise on the Mississippi River. Today is yours to explore the sights and sounds of the Big Easy. Take an optional boat trip into the Louisiana swamps or explore the streets of the French Quarter and sample the city's cuisine, which Mark Twain once described "as delicious as the less criminal forms of sin". This evening, join new friends for a Farewell Dinner at the famed Court of Two Sisters. 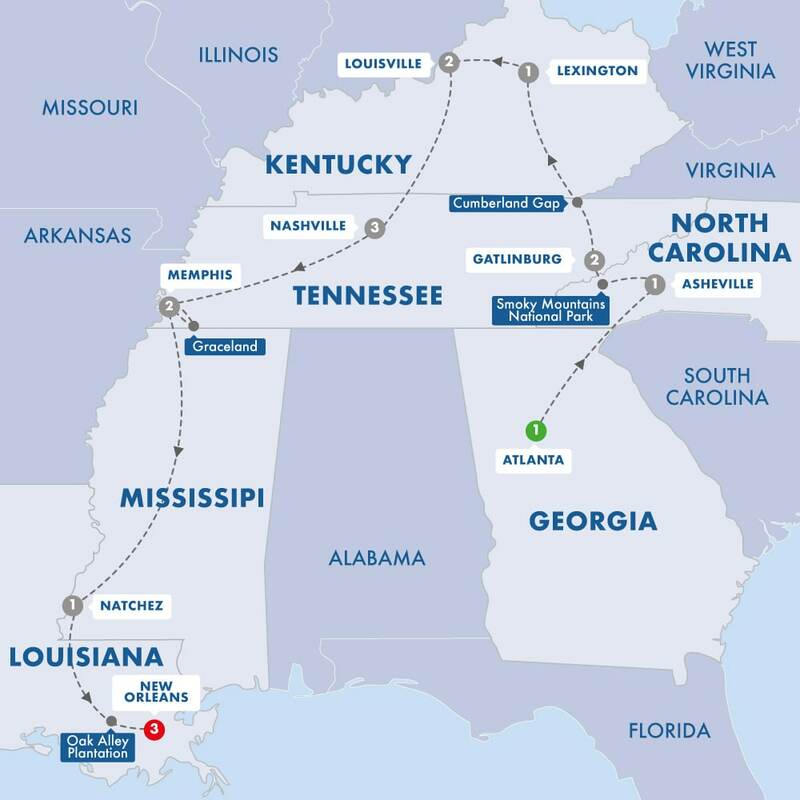 Your unforgettable encounter through America's South at its end, we take a transfer to New Orleans International Airport or consider extending your stay in New Orleans at the Sheraton New Orleans.